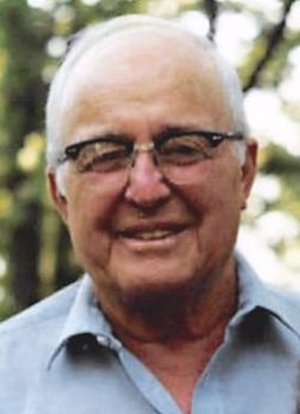 Obituary – Cockrum, Alvin Christian « Perry High School Alumni Association, Inc.
Alvin Christian Cockrum, lifelong resident of Perry, made his transition on Wednesday, January 21, 2015 at the Green Valley Nursing Home. He was nearing 97 years of age. Alvin was born February 25, 1918 at Perry, Oklahoma, the son of Charles Franklin Cockrum and Mary (Tontz) Cockrum. He was raised on a farm and worked to help his family through the Great Depression. During high school, he lived at the fire station where he volunteered as a firefighter while working at the 3-corner Conoco Service Station on the Perry square; additionally, he was hired by his shop teacher to teach his peers in the woodworking shop during his time in high school. He graduated Perry High School in 1935. He was married to Dorothy Mae Chaney on April 26, 1941 in Abilene, Texas. Alvin served his country in the United States Army during World War II where he was an expert marksman and taught his fellow soldiers sharpshooting. Alvin worked nearly 70 years as the Conoco service station owner in Perry. He continued to be a volunteer fireman some 20 plus years and in his later 30s became a successful real estate investor. He was a man of strong faith and moral fabric who was a longtime member of the First Baptist Church. His enjoyments were fishing and even traveling to Panama and Honduras to fish. He enjoyed and loved his grandkids by entertaining them with his wit and tremendous sense of humor. He also had an innate mechanical sense and could remarkably repair anything he touched, oftentimes making the end product better designed than when it was new. He is survived by his son, Randy Cockrum and his wife Sandy, of Perry; and daughter Candace Cockrum Bradway and her husband Howard, of Oklahoma City; daughter-in-law Earline Cockrum of Perry; three brothers, George Cockrum of Del City, Oklahoma, Milton Cockrum of Georgetown, Texas and James Cockrum of Wichita, Kansas; three sisters, Lenora Price of Ponca City, Marietta Moran of Tulsa and Grace McKee of Tulsa; five grandchildren, Sheila Emerson, Shelly Johnson, Paul Cockrum, April Sewell and Emerald Groom; nine great grandchildren, Leah, Jacob, Dustin, Zane, Kassandra, Carley, Clay, Curt and Mary-Skylar. Alvin was preceded in death by his parents; his wife Dorothy(on January 16, 2010); one son, Chris Cockrum (on May 18, 1999); grandson Bryan Christian Chavez; three brothers, Gilbert Cockrum, Baron Cockrum and Lorren Cockrum; two sisters, Maxine Pryor and Bernice Rice. A visitation will be held from 12:30 to 2:30 p.m. on Sunday, January 25, 2015 at the Brown-Dugger Funeral Home. Funeral services will be held at 2:30 p.m. on Monday, January 26, 2015 at the First Baptist Church in Perry. Rev. Bob E. Lee will preside over the service. Interment will be in the Grace Hill Cemetery under the direction of the Brown-Dugger Funeral Home. Casket bearers are Paul Cockrum, Cody Sewell, Mike Groom, Eddie Johnson, and Mark Emerson. Honorary casket bearers are Danny Hodge, Sam Harman, Earl VanBebber, Bill Case, Richard Kukuk, Adam Hasenfratz and Randy Beier. Memorial contributions may be made in lieu of flowers in memory of Alvin Cockrum and his grandson Bryan Christian Chavez to the Make Promises Happen, Central Oklahoma Christian Camp, #1 Twin Cedar Lane, Guthrie, Oklahoma 73044 or online at centralchristiancamp.org. Memorial contributions may also be made out to Make Promises Happen and left with the Brown-Dugger Funeral Home.